Gerald L. Clore, Commonwealth Professor of Psychology at the University of Virginia, studies the influence of emotion on thought and judgment. He formerly taught at the University of Illinois. He has been Associate Editor of Cognition and Emotion (1988-1996), and a faculty member in the NIMH Postdoctoral Training Consortium on Emotion (U-C Berkeley, 1991-1996; U Wisconsin, 1997-1999). He has held visiting appointments at Harvard, Stanford, Oxford, and New York University, an NIMH Postdoctoral Fellow at Stanford University (1980), at the Center for Advanced Study in the Behavioral Sciences (1996-97), and at the Rockefeller Study Center in Bellagio Italy (2003). Books include The Cognitive Structure of Emotion (Cambridge, 1988) and Theories of Mood and Cognition (Erlbaum, 2001). His research on cognition and emotion generally and on the affective regulation of judgment, thought, and memory in particular has been funded by the National Science Foundation and the National Institute of Mental health. Martin, L. L., & Clore, G. L. (Eds). (2001). 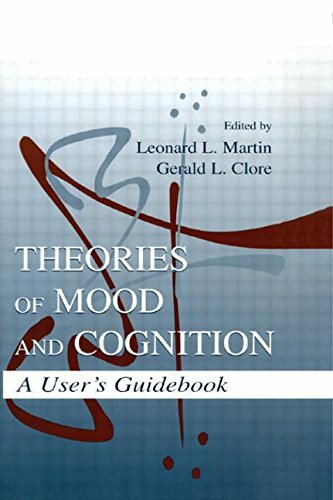 Theories of mood and cognition: A user's guidebook. Mahwah, NJ: Lawrence Erlbaum Associates. Centerbar, D. B., Schnall, S., Clore, G. L., & Garvin, E. (2008). Affective incoherence: When affective concepts and embodied reactions clash. Journal of Personality and Social Psychology, 94, 560-578. Clore, G. L. (2011). Psychology and the rationality of emotion. Modern Theology, 27, 325-338. Clore, G. L., & Huntsinger, J. R. (2007). How emotions inform judgment and regulate thought. Trends in Cognitive Science, 11, 393-399. Clore, G. L., & Ortony, A. (2008). Appraisal theories: How cognition shapes affect into emotion. In M. Lewis, J.M. Haviland-Jones, & L. F. Barrett (Eds. ), Handbook of Emotions (3rd ed., pp. 628-642). New York: Guilford Press. Clore, G. L. & Schnall, S. (2008). Affective coherence: Affect as embodied evidence in attitude, advertising, and art. In G. R. Semin & E. Smith (Eds.) Embodied grounding: Social, cognitive, affective, and neuroscientific approaches (pp. 211-236). New York: Cambridge University Press. Hunsinger, M., Isbell, L.M., & Clore, G.L. (2011). Sometimes happy people focus on the trees and sad people focus on the forest: Context-dependent effects of mood in impression formation. Personality and Social Psychology Bulletin, 38, 220-232. Koo, M., Clore, G.L., Kim, J., & Choi, I. (in press). Affective facilitation and inhibition of cultural influences on reasoning. Cognition and Emotion. Riener, C. R.,Stefanucci, J.K., Proffitt, D.R., & Clore, G. (2011). An effect of mood on the perception of geographical slant. Cognition and Emotion, 25,174-182. Sherman, G. D., Haidt, J., & Clore, G.L. (in press) The faintest speck of dirt: Disgust enhances impurity detection. Psychological Science. Solak, N., Jost, J.T., Sümer, N., & Clore, G.L. (in press). Rage against the machine: The case for system-level emotions. Social and Personality Psychology Compass. Zadra, J.R. & Clore, G.L. (2011). Emotion and perception: The role of affective information. Wiley Interdisciplinary Reviews: Cognitive Science. Chichester, West Sussex: John Wiley & Sons. Clore, G. L. (2011). Thrilling thoughts: How changing your mind intensifies your emotions. In R. Arkin (Ed.) Most Underappreciated: 50 Prominent Social Psychologists Talk About Hidden Gems (pp. 67-71). New York: Oxford University Press. Clore, G.L. & Robinson, M.D. (2012). Five new ideas about emotion and their implications for social-personality psychology. In K. Deaux & M. Snyder (Eds.) Oxford Handbook of Personality and Social Psychology (pp. 315-336). Oxford: Oxford University Press. Clore, G. L. & Robinson, M.D. (2012). Knowing Our Emotions: How Do We Know What We Feel? in Vazire, S. & Wilson, T.D. (Eds.). Handbook of Self-Knowledge (pp. 194-209). New York: Guilford Press. Huntsinger, J. R. & Clore, G. L. (2011). Emotion and social metacognition. In, P. Briñol and K. DeMarree (Eds. ), Social Metacognition (pp. 199-217). Psychology Press: New York. Schwarz, N., & Clore, G. L. (2007). Feelings and phenomenal experiences. In E. T. Higgins & A. Kruglanski (Eds. ), Social Psychology. A Handbook of Basic Principles (2nd ed., pp. 385-407). New York: Guilford Press.